Changes in shoreline through processes of accretion and erosion can be analyzed in a geographic information system (GIS) by measuring differences in past and present shoreline locations. Several resources are available for both extracting shoreline positions and quantifying shoreline change. Shoreline proxies include the vegetation line, dunes toe, high water line (or wet/dry line), among many others. Since these shorelines are visually interpreted in the field or from imagery, the process of shoreline extraction is time consuming and subject to human interpretation. Shoreline extraction from lidar is an alternative method that is efficient and is not subject to human interpretation. One of the main benefits of lidar data for developing shoreline data is the ability to derive a true datum-based shoreline - that is a shoreline that is tied to a single specific tidal datum elevation, such as mean high water. 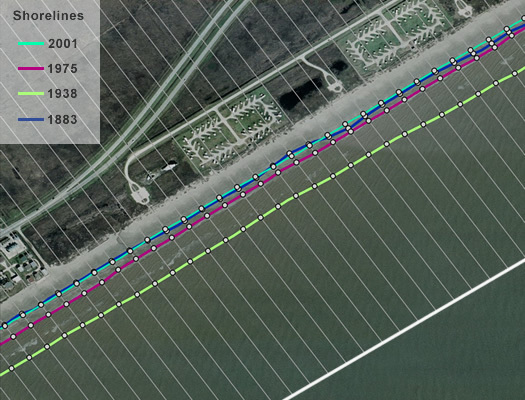 The following steps guide you through the processes to create a datum-based shoreline. 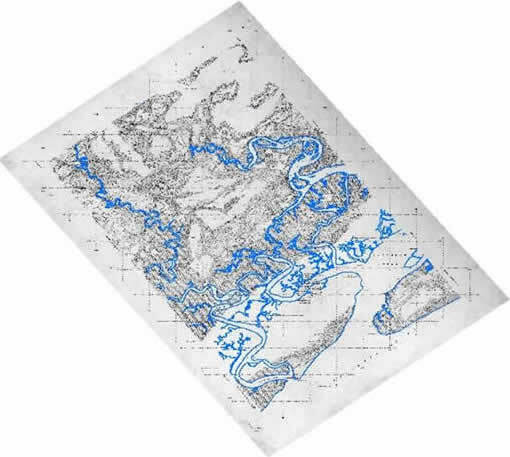 Extracting a shoreline from maps and historical manuscripts involves accessing the data, georeferencing the map or survey, and vectorizing or digitizing the shoreline boundary. To learn more about georeferencing a map or T-sheet, view the interactive online training. To access historical shoreline manuscripts or T-sheets, visit the NOAA Historical Shoreline Survey Viewer. Historic and modern shorelines can be used as a basis for determining shoreline change rates. It is helpful when determining long-term shoreline change to have sequential historic shorelines dating as far back as 100 yrs to the most recent available shoreline. The baseline is an arbitrary line that can be drawn either shoreward or landward of shorelines to serve as the origination point of transects used for calculations. Transects are cast either manually or using an automated system (ie. DSAS). Automated systems have the ability to cast transects quickly over large areas. 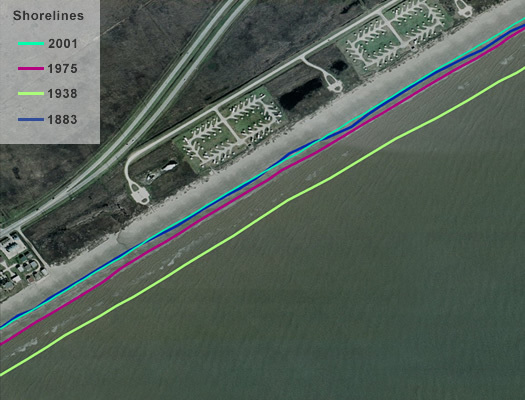 The rate of change can be determined by measuring the distance between the shoreline/transect intersection points. Linear regressions are common statistical analyses for determining shoreline change rates.